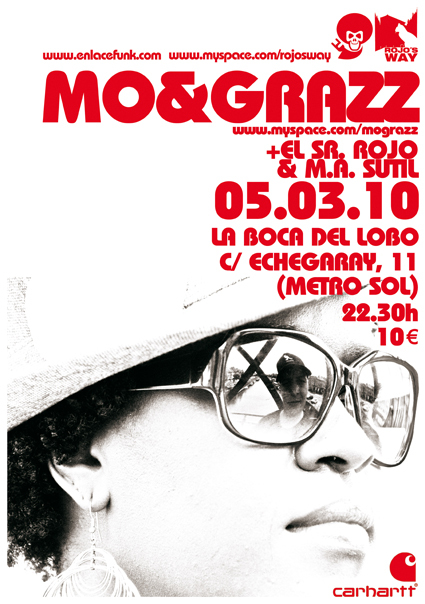 They are in love, married and do music together: Mo & Grazz are a symbiotic twosome who were meant for each other. With their second longplayer Gemini they face up their love for Soul, Funk, R&B, Jazz, and Hip Hop onces more. Now they perform their passion live. On stage DJ Grazzhoppa is in charge for the turntables. While scratching hooks and mixing the rhythms of their tracks, Mo screams and croons into the microphone in order to enrich the show with an organic touch of unflattering Soul. Together they are tight as a Big Band that jams fevered through his repertoire. And this with an artistic balancing act, that accomplish the atmosphere of a club night with the drive of a live performance.